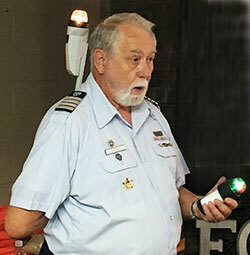 The FOR San Bernard Environmental Committee hosted a boater education course, the third program of the 2018 series of environmental subjects, on Sat Jun 23 at the FOR Community Center. 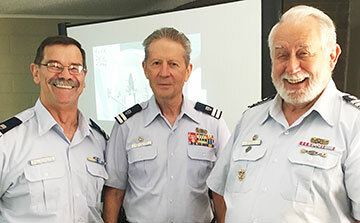 It was taught by USCG Auxiliary instructors. Class attendees received their Texas Safe Boating card from Texas Parks & Wildlife after passing the USCG Aux test. Much thanks to the generous effort by the Meagher family for facilitating this FOR Environmental Committee program. class were l. Bill Schaefer, Fred Steves and Frank Muraglia. Muraglia demonstrates locations of navigation lights. 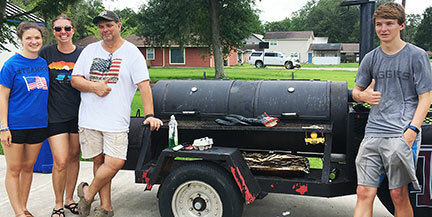 The Meagher-Overholser cooking team provided a smoked chicken lunch with cheesy potatoes, “scooter” beans and brownies for desert. Pictured l. is Sophia Meagher, Cindy Overholser - Program Facilitator, Brian Meagher - Program Facilitator and Aedan Meagher. 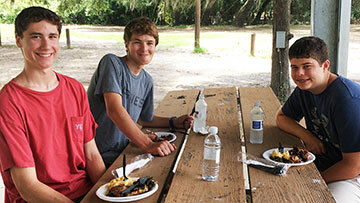 Sam Whitmarsh, Aedan Meagher, Cooper Herrington enjoy the lunch break. 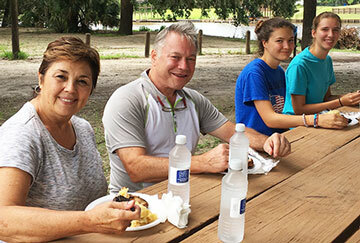 Mike and Rosie along with Sophia Meagher and Caroline Sablatura enjoy lunch .